Fifth House Ensemble » How’s the Beethoven going? Glad you asked! 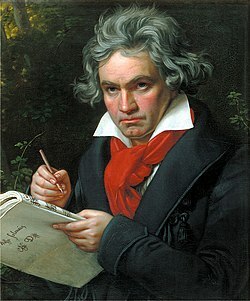 How’s the Beethoven going? Glad you asked! The following post is brought to you by Clark, our resident Viola player, who clearly loves himself some Monty Python. (Let’s be honest, who doesn’t?!?). Clark provides us with a sneak peek into what’s going on at rehearsals while Fifth House prepares to play Beethoven’s Septet for the season finale of the Rush Hour concerts. It sounds like rehearsals are just as exciting as performances! Last Friday evening, the seven of us prepping Beethoven’s Septet for next week’s Rush Hour Concert (5:15pm Tuesday the 30th – it’s free so you better be there!) had rehearsed for an hour and a half or so. We’re getting good work done, finding funny moments here and there, but more and more looking at the clock and saying to ourselves, “Huh… It’s 8pm on a summer Friday evening. Why exactly am I stuck in Winnetka rehearsing?” However we’re not done yet, and now it’s time to read/play/rehearse the sixth and final movement. Drew has a lovely E-flat octave to play for the movement’s very first chord, and he jokingly wonders if he can sneak off stage between movements 5 and 6 to set the octave. I helpfully suggest that he fake a nosebleed as an excuse to get off stage. But now, time to play. UNISON E-FLAT! So far so good, though we’ll of course check our tuning later. And then, only five notes into the movement, Matt finds a note on his horn that suddenly takes the whole piece from good old 1800’s Vienna to 1400’s Flanders. We’re talking about a serious Gregorian-monks-chanting-in-the-abbey style chord progression here, and because we’re now a group of punchy, hungry, nerdy musicians, we all find this completely hilarious. We bust out laughing, far too hard to play, and so rehearsal just stops. I think it’s Eric who shouts out in the middle of the commotion “Holy Renaissance Batman!”, while I wait for an opening before providing in my best Monty Python voice, “My Liege!” and drawing yet more laughter. Certainly one reason that we are now having so much fun is that we first tackled this piece back in January for The Weaver’s Tales. That rehearsal and performance process was great, but now we can impart even more musicality and fine tune still more details simply because we know we can play this piece. I guess all this is to say we’re having a blast preparing this piece for next week’s concert, and we just can’t wait to play it for you all.